Av. Parque, 62, 21410 Isla Cristina, Spanje. 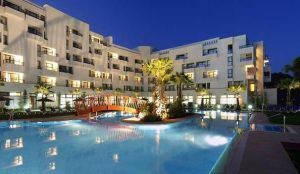 Modern hotel next to the beach in Huelva. The Oasis Isla Cristina Hotel is a big avant-garde establishment, perfect to enjoy your holidays on the beach. 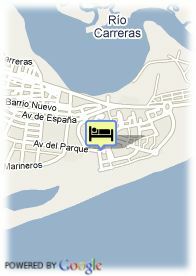 This hotel is located on Isla Cristina center, heavenly small town from Huelva. Enjoy the entire flavor from Andalucía in this modern hotel. It disposes of 148 suites, totally equipped and aimed in order to offer the maximum comfort and contentment. Among this hotel facilities, stands out its magnificent restaurant, where the clients can taste the best of the Andalusian, Spanish and international cuisine. Situated at 200 meters from the beach, the Oasis Isla Cristina is an excellent option if you want to spend pleasant holidays next to the sea. Betalende overdekte parking aan het hotel (9.63 €).